Matronics Email Lists :: View topic - A brown-out alternative? Posted: Mon Oct 08, 2018 5:10 pm Post subject: A brown-out alternative? practical if not elegant solution. features at prices attractive to the community. dreaded CBOT(cranking brown out transient). the capacitors would fill in the energy gap. Only down-side being it adds a battery to the airplane. mis-treatment. Good. But it adds to cost. the battery(ies) with go/no-go criteria for replacement. they quit worrying about the ship's main battery. will boost 10 or so volts, depressed battery to 14v . . .
via crew controlled push button. should exceed lifetime of the airframe. for preflight ops such as ATIS and clearance collection. replaced in the first few minutes of flight. Cogent arguments pro and con are most welcome. Posted: Mon Oct 08, 2018 5:48 pm Post subject: A brown-out alternative? That looks very clever. I think that it will work. Is my logic here correct? For my plane, which has two alternators and no endurance bus, I would create an "EFIS" bus, running only the EFIS, and fed via two diodes, one to the main bus and the second to the DC/DC upverter. For those of us who don't live and breathe this stuff, can you post a few typical part numbers for the upverter and the diodes? Or typical specs? Thank you for attending to this issue. Posted: Mon Oct 08, 2018 5:50 pm Post subject: A brown-out alternative? Am I correct in assuming that the right hand side of the start push button should be tied through a fuse to the main bus? Posted: Mon Oct 08, 2018 6:11 pm Post subject: A brown-out alternative? ��� should exceed lifetime of the airframe. I like it; I might try it out on my old RV-4 electrical system. 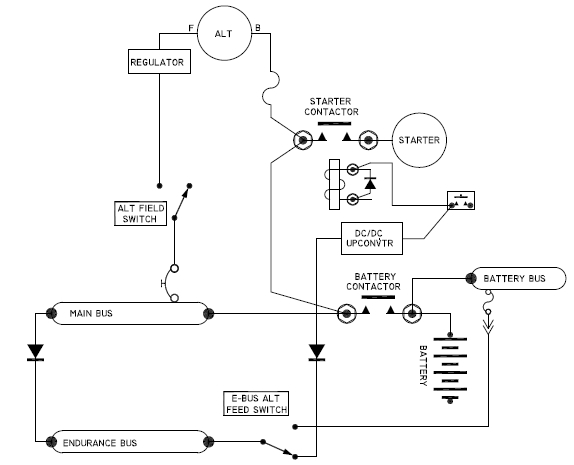 It's a pretty simple, crude system, but the Matronics� fuel flow meter reboots on startup. Only potential downside I can see is that some avionics systems may well draw a total of 5 or 6 amps. If battery voltage drops down in the 8-9 volt range, you could see an additional 8 or 10 amps of load on the start PB. There are some planes out there that have the start PB� feeding a starter with built-in solenoid/contactor; in those cases, the PB may be pretty heavily loaded. I toyed with the idea of using one of those 'switchers' to replace the isolation diode if I'd used a dual battery system (instead of the dual alternator system chosen) on my electronic injected engine installation. Posted: Mon Oct 08, 2018 9:55 pm Post subject: Re: A brown-out alternative? I mentioned a few days ago that I thought I had yet another solution to the perennial brown-out gremlin. Clever idea, Bob -- I like it! As Charlie mentioned, the current drawn by the DC-DC boost converter could be significant, and would of course increase with decreasing supply voltage. There's also the likelihood of substantial inrush current at start-up. Unless an adequately beefy start switch is specified, its contacts might suffer from making and breaking this load. This problem might be mitigated by powering the DC-DC boost converter either from the load side of the starter contactor (in parallel with the starter) or via a cube-type automotive relay. This would also simplify adding this design as a retrofit, since the start switch wiring/CB/fuse would not have to be upgraded to carry the boost converter's supply current. If one didn't want to use an eBay boost converter of unknown quality, Digi-Key offers this unit, which is specified for high vibration and extreme temperatures in railroad use, but doesn't cost a fortune. However, its minimum input is 9V, which might not be low enough in some cases. Posted: Tue Oct 09, 2018 10:12 am Post subject: A brown-out alternative? > I mentioned a few days ago that I thought I had yet another solution to the perennial brown-out gremlin. > Cogent arguments pro and con are most welcome. switch would have a good service life. shouldering a load that is already powered up. converter has time to come up and shoulder the load. button is release, boost drive goes away. supports appliances vulnerable to CBOT. Somebody mentioned a potential avionics load of 6A? a detailed load analysis is indicated. if puss came to shove, one could simply add an "E-BUS BOOST"
drop to give an e-bus boost of 14.3 volts or thereabouts. what I can offer individually just now. Posted: Tue Oct 09, 2018 10:50 am Post subject: A brown-out alternative? I did the analysis for am MGL Challenger (10.4 inch display) system with dual screens. These numbers are from MGL's documentation; I have not measured them. Posted: Tue Oct 09, 2018 12:18 pm Post subject: A brown-out alternative? � a detailed load analysis is indicated. Posted: Tue Oct 09, 2018 1:22 pm Post subject: A brown-out alternative? I have an issue with my P mags during start , Due to my little Li Fe battery during initial cranking the bus voltage drops to 7-8 volts , the engine does not fire until the bus recovers to above 9volts and the ignition comes back on line . .. If i fitted one of these to my P mag power feed , would that solve it ??? On Tue, Oct 9, 2018 at 1:34 PM Robert L. Nuckolls, III < nuckolls.bob(at)aeroelectric.com (nuckolls.bob(at)aeroelectric.com)> wrote: Somebody mentioned a potential avionics load of 6A? Â In the standby (non transmitting mode)? Obviously Â a detailed load analysis is indicated. Bob, I did the analysis for am MGL Challenger (10.4 inch display) system with dual screens. Typical current draw for both screens + iBox + RDACÂ + AHRSÂ + magnetometerÂ = 2.90 amps Maximum = 5.64 amps These numbers are from MGL's documentation; I have not measured them. Posted: Tue Oct 09, 2018 2:35 pm Post subject: A brown-out alternative? Does the bus stay below 9v during cranking? Posted: Tue Oct 09, 2018 2:53 pm Post subject: A brown-out alternative? I’m have a Skytech starter and a Aerovoltz 12 cell li fe better. Posted: Tue Oct 09, 2018 3:27 pm Post subject: Re: A brown-out alternative? Keep in mind that the capabilities of some of the DC-DC converters from China are exaggerated. Compensate for that by purchasing one with a higher rating. Posted: Thu Oct 11, 2018 9:40 pm Post subject: Re: A brown-out alternative? I wired it as shown so that in the milliseconds after start switch closure until the contactor closes, the converter has time to come up and shoulder the load. That makes perfect sense. My suggestion would have caused the DC/DC converter to start up as the bus voltage was sagging, losing the time advantage inherent in your schematic. I would set this critter to 15 volts with a 0.7 volt diode drop to give an e-bus boost of 14.3 volts or thereabouts. This would be about 2 volts higher than the open circuit on an SVLA battery. I saw those too... The 10V minimum input seemed possibly marginal, though you might find that they're happy to work below that level. The converter at this link claims to operate down to 5V and to output 6A. That said, Joe's comment about exaggerated Chinese specs is right on. Amperes in China seem to contain about half as many electrons as amperes in the rest of the world! Another feature to be explored is drop out delay in the starter contactor caused by slow decay of coil current through the catch diode. When the start button is released, boost drive goes away. The start button is held until the engine catches and starter current drops dramatically. Hopefully battery voltage will have returned to a value that supports appliances vulnerable to CBOT. If this proved to be a problem, we could craft a system that sequences start events. The attached schematic is my first pass at it. I used a TLC3704 quad comparator (for its push-pull outputs), two relays and a handful of jelly-bean parts. It's a bit of a dog's breakfast, but it should work. When the start switch is pressed, Q1 turns on, completing a ground path for K1 to energize. The output of comparator U1.1 immediately goes high, which in turn (through the diode-OR network of D2 and D3) causes the output of comparator U1.4 to go low, energizing K2 through Q3, which powers the DC/DC boost converter to support essential avionics. C2 charges through R4, taking about 100mS to reach 7.6V, whereupon the output of comparator U1.2 goes low, energizing K1 through Q2, which in turn energizes the engine starter contactor. C3 charges through blocking diode D1, causing the output of comparator U1.3 to go high, reinforcing the signal at U1.4 pin 10. When the start switch is released, R1 immdiately turns off Q1, causing K1 to drop out, cutting off the engine starter contactor. R1 also turns off the output of U1.1, but the high at U1.4 pin 10 is held by the output of U1.3. C2 discharges through R4 and the output of U1.1, causing the output of U1.2 to go high (this has no effect, since Q1 has already turned off K1). C3 discharges through R5; after about 100mS C3 drops below 4.4V and the output of U1.3 goes low, causing the output of U1.4 to go high, turning off Q3, K2 and the DC/DC boost converter. Posted: Fri Oct 12, 2018 12:59 am Post subject: Re: A brown-out alternative? The on-delay from energizing a relay plus energizing the starter contactor might be enough without an electronic circuit. Human reaction time will provide an off-delay. Posted: Fri Oct 12, 2018 9:23 am Post subject: A brown-out alternative? > I wired it as shown so that in the milliseconds after start switch closure until the contactor closes, the converter has time to come up and shoulder the load. the starter contactor releases and unloads the battery? dropout delay would not be out of line. Posted: Fri Oct 12, 2018 1:59 pm Post subject: Re: A brown-out alternative? Now my concern is that when the starter button is released, does the boost disappear too soon? i.e. before the starter contactor releases and unloads the battery? 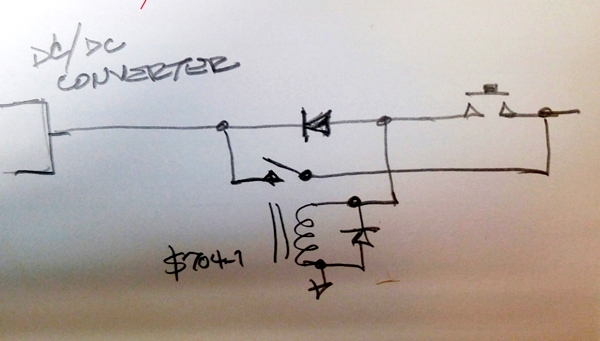 The circuit does delay shut-off of the boost converter. Press start button: boost converter powers on immediately, then after ~100mS delay, engine starter spins. Release start button: engine starter stops immediately, then after ~100mS delay, boost converter shuts off. The starter-on and booster-off delays are easily customized by adjusting the values of R4 and R5, respectively. Posted: Sat Oct 13, 2018 7:46 am Post subject: A brown-out alternative? defined as steps toward the elegant solution. parts can you take out and still meet the spec? Posted: Sat Oct 13, 2018 10:07 am Post subject: A brown-out alternative? B+ coming in on the Right Hand Side? If so, wouldn't the relay be energized all the time the B+ is turned on? And the momentary switch not being required? Posted: Sat Oct 13, 2018 10:13 am Post subject: A brown-out alternative? Posted: Sat Oct 13, 2018 10:27 am Post subject: A brown-out alternative? Barry, B+ is on the right side and I belive the momentary switch is the starter switch.